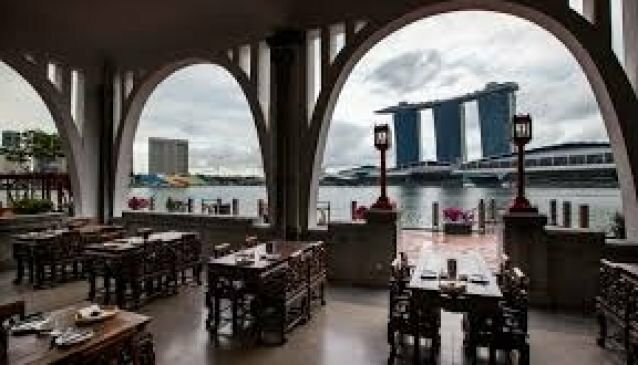 Named after the famous embankment along Huangpu River in Shanghai, One on the Bund in the historic Clifford Pier at Marina Bay offers a contemporary interpretation of Northern Chinese Cuisine in an impressive 10,000 sq.ft within the Fullerton Bay Hotel. With its stunning and stupendous arched trusses spanning the entire length of its space, One on the Bund can't be missed once you enter the hotel. State of the Art Open Flame Roast Duck Kitchen; A Noodle Bar with open concept kitchen; A Dessert Bar, western pastries with Asian influence are some of the highlights of the restaurant. At One on the Bund, you can relish in some scrumptious Bamboo Clams in Chinese Rose Wine and Chilli Padi, Fried Mandarin Fish Fillet in Peppercorn Sauce, Sautee Kale vegetable with Salty Fish. Else, go for the Shanghai Handmade Noodle freshly made from One on the Bund Noodle Bar.